I was putting on my climbing shoes at the base of a cliff when I noticed a dark-red blood spot on my left ankle. It was smaller than a dime, yet uncomfortably large. What the hell?, I thought, staring at it for a second like a rookie medic. I tried to recall — did I scrape myself, or bang into a rock? That was the usual source of minor injury on this sort of outing. But I felt no pain. I wiped the blood off and was surprised to see unblemished skin. Another blood spot then appeared on my calf. I realized what was happening and looked straight up 60 feet of granite to the overhanging top of the route. The total mileage on this one depends on where you begin. If you don't want to go from home, you can begin by parking near Power and McDowell roads in Mesa, which is near a Loop 202 exit. From there, pedal north on Power Road, which turns into Bush Highway after entering Tonto National Forest. The austere, Sonoran countryside on the highway will take your mind off the hills — of which there are plenty. A morning ride is best to avoid the boat-hauling pickups and other lake traffic. If you haven't been to the marina or lake area, take the time to ride in for a cold drink and snack. Turning around at Saguaro Lake will give riders about 25 perfect miles total. For more mileage, more hills, and more beautiful desert, keep going north a few more miles and turn around at the Beeline Highway (whether or not you stopped at the lake). Overall, it's a fantastic, destination-oriented ride. Hole-in-the-Rock at Papago Park is just the spot for a sunrise hike. We don't need anything challenging so early — a quick hike up to the hole at 5:30 in the morning is plenty. The area around the hole is smooth; bring a blanket and spread out. Once it's light, there are longer trails to hike and bike, plus you're not far from downtown Tempe or central Phoenix. Coffee beckons. "Wastewater treatment" doesn't bring to mind a natural oasis. But in Gilbert, the city's water management system has birthed a surprisingly popular birdwatching venue. The city began storing treated wastewater in a series of ponds in the mid-1980s near Guadalupe and Gilbert roads, and birds such as egrets and warblers flocked to the site as a result. Birdwatchers dutifully followed, and now the Riparian Preserve at Water Ranch attracts thousands of people every year. Fans praise the waterfront because of how many species you can spot: Shorebirds and herons are common, but birders can also glimpse hawks and owls. Goats: They're just like us! They scream for attention, they're known for overeating, and now they participate in trendy group fitness classes. Goat yoga is growing in popularity all over the country, and in metro Phoenix, the place to do it is Arizona Goat Yoga. Longtime friends April Gould, a goat farmer, and Sarah Williams, a yoga teacher, have combined their interests to create a fun, low-impact experience. Participants show up at one of several farms in the far southeast Valley with a towel or a mat, then spend about an hour doing basic poses as baby goats and miniature goats dressed in outfits and accessories frolic among (and on) them. If yoga really isn't your thing, but playing with goats is, that's not a problem: You have to pay to attend, but once you're there, you can do as little or as much actual yoga as you want. Variations on the basic class include the Goat Yoga Pajama Party (the goats wear PJs, not the humans) and the glowstick-heavy Goat Yoga Rave. We can't say we got much of a workout, but animals dressed up in costumes make any exercise session more enjoyable. Though our neighbors to the west have the most famous Joshua trees, Arizona has a stash of the U2-favorited agave plant definitely worth hitting the road to see. Hop in the car and head toward Las Vegas on U.S. Route 93. There's not much to see for a while, but eventually desert peculiarities emerge. First, you'll see the strange Snoopy Rocket of Wikieup, then you'll began spotting random Joshua trees until you hit a thick, dense forest of them nestled in the desert landscape. You'll also spot a sign reading "Joshua Tree Parkway of Arizona" — that is, if you can take your eyes off the trees. The time for wildflowers — our short yet beautiful spring season in March, April, and May — is a special time. Colorful Arizona wildflowers line the side of the road, fill up our backyards and garden centers, and populate the landscape of many hiking trails. A scenic one in particular is the Dixie Mountain Loop Trail at the Phoenix Sonoran Preserve in north Phoenix. This single-track, 4.7-mile trail has an elevation gain of 807 feet, and there are lots of cactus, yucca, blooming cholla, and desert flowers like yellow Mexican prickly poppy and purple lupine. And keep an eye out for that burnt-out vehicle along the trail. The whole thing takes about an hour or more, and dogs are welcome on a leash. And as there are no trees, consider a hat, sunscreen, and your phone on full brightness for shots of the flowers. Goldilocks would love Pinnacle Peak Trail. Camelback Mountain or Piestewa Peak? Too steep. South Mountain or the Superstitions? Too long. But the four-mile out-and-back path at Pinnacle Peak Park in Scottsdale is just right. It's a workout that takes an hour or two, a soul-nourishing walk through a lush, Sonoran Desert landscape, and a brush with the truly wild. What's not to love? Well, admittedly, the park could stay open longer instead of shutting its gates at sunset. But that would annoy the owners of the posh mountain homes surrounding the peak, so the park opens late and closes early, with rangers shooing everyone out when the sun sets. Get there in daylight hours, though, and the trail is yours to enjoy — along with a few hundred other visitors. Don't fret about the foot traffic, though. People tend to be friendly at this park, probably because the trail is wide enough in most places to avoid bumping elbows. The trail's 1,300 feet of elevation gain is greater than Camelback or Piestewa, but that's the average after all its ups and downs. You won't reach the Peak's summit — that's only possible with rock-climbing experience. But the trail brings you near the base of the impressive pinnacle of granite that gives the place its name. Along the way, you might spot a bobcat or hawk or (hopefully at a safe distance) a rattlesnake. If you live anywhere near this trail, it's probably already a regular favorite. Have you seen those new comfort bikes with the fat tires and the cushy seats? Right, you wouldn't want your friends to see you riding one. So we've got the perfect place for you. This off-the-beaten-path little canal provides smooth riding for about five miles, just south of Baseline Road in Phoenix, from Central Avenue to around South 40th Street. There are trails on both sides of the canal, paved on the south side and hard-packed dirt on the north side, which is actually smoother than the asphalt. The route provides scenic views of South Mountain as you ride past the new housing developments that are sprouting like fruit trees and cotton once did in south Phoenix. Best of all, you won't encounter a lot of other bikers, pedestrians, or dogs, and there isn't a lot of traffic to deal with at the cross streets, either. The only trailhead parking is at Circle K Park, at 12th Street. It's time to get out of that rock gym and take your calloused fingertips to the Valley's best granite playground — the McDowell Mountains. C'mon, it's not too hot! Hundreds of rock-climbing routes populate thousands of acres of the McDowell Sonoran Preserve, some accessible by specially marked trails for climbers. The Arizona Mountaineering Club identifies 18 distinct locations, each with multiple climbing routes. None of the routes is taller than 150 feet, but don't let that discourage you. It would take years to bag every route in the McDowells, and the variety and easy access is well worth the trip. Sven Slab, for instance, sports at least 25 climbs ranging from 5.4 to 5.10c, meaning there's something there for everyone. Our favorites include Sven Slab, Morrell's Wall, Gardner's Wall, and Tom's Thumb. But other spots like Granite Ballroom, Hog Heaven, Goat Hill, and Thrasher offer terrific short climbs and bouldering options. Most of the climbing areas are within a couple of miles of the Tom's Thumb trailhead parking lot. But don't expect the climbing trails to be as casual as the trails used by hikers. Be extra-cautious here to avoid trouble. Scrambling and minor boulder moves are required to get to some spots. Plus, some areas are relatively remote, even when you can see houses far below. While on your belay ledge, keep an eye — and camera — out for sightings of wild horses, javelinas, and other desert wildlife. People drive from all over metro Phoenix to visit the Phoenix Rock Gym, which is actually in Tempe. Sure, there are other rock gyms in the area, and some of them are pretty good. But none match the state's first rock gym for style and camaraderie. PRG opened in 1992 as a labor of love by local climbers. How has it survived all of these years, through multiple recessions, when so many Valley businesses have closed? Again, love. Yes, the gym has two kickass bouldering areas, an exclusive lead-climbing room, and enough 30-foot-high routes for any grade of climber. As a place to work out and improve skills, it's a phenomenal facility. But it's not just the exercise that brings customers back. Going to the PRG is like going home. It's a comforting place that feels safe, and not just because of the padded floors. You get the pump and excitement you need there, but also — if you're open to it — genuine, non-electronic socializing. Egos are on display only minimally, and it's rare for unfriendliness to mar the experience. That ultra-ripped 5.13 climber cheering you on actually wants to see you nail that 5.9, because you tried. Besides the easygoing clientele, PRG boasts a terrific staff — friendly folks who take time to get to know the regulars, and who are as patient as kindergarten teachers in instructing newcomers with no climbing experience. May PRG's doors always stay open and its swamp coolers never fail. Big Surf is a Valley tradition, and with good reason. The nation's first wave pool offers respite from the summer heat and (lesser-known fact) a damn good place for serious surfers to practice when California is a little too far. Add classic pools, slides, and thatched roofs, and you've got your weekend plans right there. 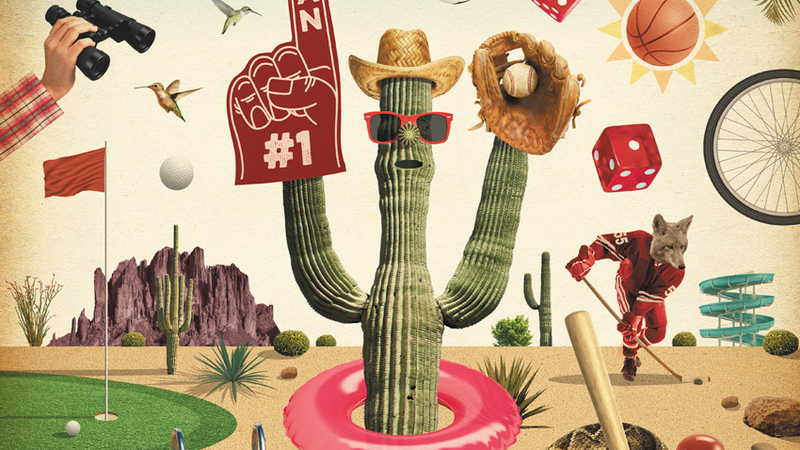 When it comes to hotel pools in metro Phoenix, we've got an embarrassment of riches. There are more beautiful resorts than you can shake a pool noodle at, and most of them have water features we'd be happy to visit. But of all the swimming holes in town, there's nowhere we'd rather be than the Westin Kierland Resort & Spa in north Scottsdale. The Adventure Water Park welcomes all ages and includes the Adventure Pool, a 110-foot-long water slide, a FlowRider attraction for when you're feeling active, and a lazy river you can tube down when you're not. There are plenty of deck chairs for lounging poolside, and stylish cabanas available for rent. And when we're done with the high-energy fun and just want to relax, we head over to the adults-only Aguamiel Pool for a more serene swimming experience. Best of all, you can buy a resort pass for the day, so you don't have to fork over the cash for a room to experience the best hotel pool in town.